Best known for their supposed ability to predict spring weather and giving Bill Murray Déjà vu, the groundhog is one of the most notorious garden pests in the Eastern US. These large rodents may look adorable and have a generally laid-back demeanor, but they’ll devour your entire garden before you know it. You may be wondering if this critter is the one hanging out in your backyard and more importantly, how to get rid of groundhogs once you know they’re there. Read on to learn if this rodent has moved onto your property and how to get him back off of it. Get a free quote from top local service pros in your area. Will Mothballs Get Rid of Groundhogs? These big creatures are actually close relatives of squirrels, despite their size. They can be very shy and are rarely aggressive unless cornered. Because they are one of 14 different marmot species, it can be easy to confuse them with other common pests. These critters live 3-4 years in the wild and have an average life expectancy of 6-8 years (14 year old groundhogs have been documented in captivity) and rarely stray more than 150 feet from their burrow, making a resident groundhog a long-term tenant. Picture a giant squirrel with a short tail and you’ll have a good starting image. In fact, they are a part of the squirrel family and have the ability to both climb and swim. 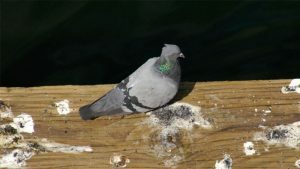 Their two coats of fur are shades of brown and sometimes grey, with occasional instances of albinos or nearly black fur. Their feet are covered in dark brown or black fur and are good digging tools. A somewhat unusual quality among rodents, groundhog incisors don’t protrude when their mouths are closed and tend to be whitish instead of the common brownish-yellow of most rodent teeth. On average, groundhogs measure 1 to 2.5 feet long and weigh 7 to 13 pounds, although they can potentially grow to be 24 inches (3 feet) long and weigh as much as 30 pounds when in an area with few predators. Groundhogs generally prefer wooded or grassy areas. 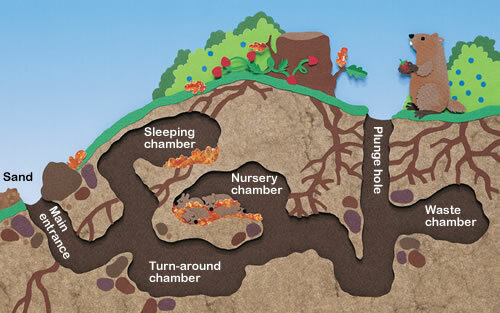 They’re burrowing creatures, and a burrow will generally include multiple escape routes. As a general rule, they’re solitary animals, although females bear litters of four to six pups (sometimes called chucklings) between March and April and will raise them for approximately three months before they depart to make their own burrows. Groundhogs really are fascinating and intelligent creatures that keep a tidy home. A new burrow can be created literally overnight and is surprisingly large. 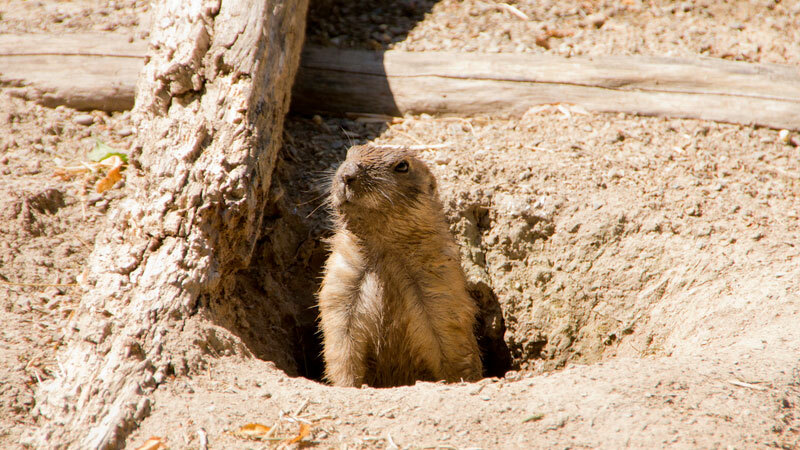 You can usually identify a groundhog burrow by the large mound of dirt around its entrance. To create the main entrance, a groundhog will burrow down at an angle approximately five feet, then back up two feet. This helps prevent flooding. The burrow proper is constructed here and consists of a 30-foot tunnel, a couple escape tunnels, and two side chambers. The bedchamber is lined with grass, which is replaced with fresh grass during the spring if young are expected. The other chamber serves as an indoor bathroom. When the toilet has been filled, the groundhog seals up the entrance and digs a new bathroom chamber. Burrows are an important part of mating, as males gain an overwhelming urge to mate after hibernation. They seek out other burrows and cautiously enter a female’s home if the scents suggest she is single, hoping she’ll invite him to the bedchamber for some quality time. Groundhogs are one of the few species that sleep through the entire winter. Throughout summer, they feast in an effort to build up a nice layer of fat. The first heavy frost marks bedtime, and the groundhog curls up into a ball in its bedchamber and slows its breathing and heart rate. Studies show that the heartbeat can slow from 100 beats per minute to only four, while the body temperature may drop as much as 50 degrees. 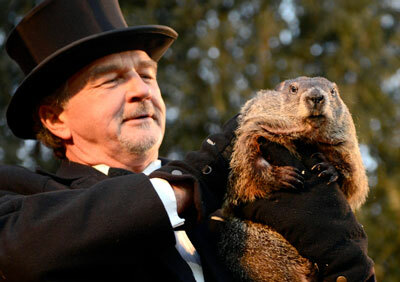 One of the biggest attractions to groundhogs is their national holiday on February 2nd. This holiday is based upon the myth that groundhogs can predict an early spring if they emerge from their burrow and don’t see a shadow. In reality, however, latitude has a major impact on hibernation times, and many groundhogs will sleep right through their holiday into early March. Groundhogs (like prairie dogs) are primarily herbivores and prefer to eat berries, grass, red clover, ruffage, and bark. They have a reputation for eating vegetables and other crops which make them a nuisance in the garden. However, they are also known to eat a lot of other garden pests, including caterpillars, grubs, grasshoppers, and snails. Groundhogs communicate through a wide range of sounds, as well as through scent glands. Sounds include barking, chattering, growling, hissing, and shrieking. Some audio examples of groundhog sounds can be found at Hoghaven. Depending upon where you live, groundhogs might be known by several different names. The most common nickname is the woodchuck, which many people mistakenly think refers to a different animal. Other common nicknames include land beaver and whistle pig. Juvenile beavers are often mistaken for a groundhog at a distance, due to a very similar appearance. However, beavers aren’t part of the squirrel family and exhibit a lot of telltale signs that help with identification. The wider tail and much larger size of beavers are signs that aid in identifying adults, and while groundhogs can be seen during the day, beavers are most often spotted at night. If you can get close enough or view their tracks, the hind feet of beavers are webbed, while the groundhog has individual toes. Beavers also tend to live closer to water, as they build their homes on the surface to help deter predators from entering. Groundhogs, meanwhile, build their homes underground. One telltale sign is their food source. Groundhogs eat leafy plants, fruits, and vegetables but also sometimes eat insects. Beavers, meanwhile, will gnaw on trees and wooden surfaces (which may include your deck or lawn furniture!) and leave behind tooth marks. The term gopher has often been applied to ground squirrels and other non-gopher species, making it a little difficult to do a proper comparison. However, the 36 species of pocket (or true) gopher all share some specific traits that set them apart from groundhogs. Groundhogs grow to be several feet long, while the gopher’s body remains a similar size to squirrels (excluding their tails). Also, gopher fur will always blend into the same color as the soil where it lives. You will also see active gophers during the winter months. Finally, groundhogs graze while gophers hoard their food using cheek pouches to transport food to their smaller dens. As noted above, groundhogs and woodchucks are the same animal. Some regions of the country may use one name over the other. The real reason why groundhogs are called woodchucks is more complicated. There are a lot of methods for getting rid of groundhogs and woodchucks, but some are a lot more effective than you might expect. Here are some of the most popular ways to evict a groundhog from your property (and keep them out). One of the best ways to get rid of groundhogs is to find them another place to live. Remember that a groundhog can excavate a new den overnight and lives a solitary lifestyle, so don’t feel bad about transporting the little guy somewhere else. There are different live traps available, but most follow the same rules for use. Note: Be sure to check up on local and state regulations first to see whether you are allowed to catch a groundhog yourself or must call to have wildlife officials perform the task. Covering the trap in mud can be a good way to begin the camo process. Place the trap up against the den entrance and stick your bait in as far back as possible to ensure the groundhog is fully inside. Placing some bricks or heavy stones on top will help prevent the groundhog from knocking the trap over. Next, prime the trap and cover it with sticks, leaves, and other debris. 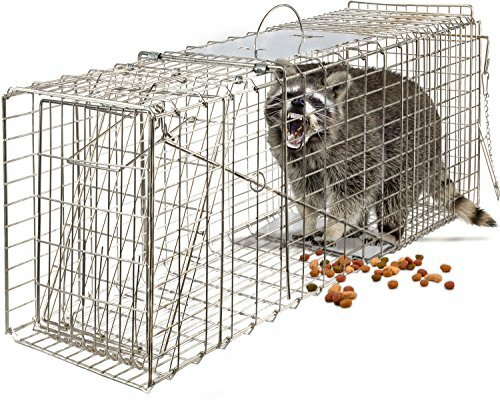 Be sure to check the trap often, and be ready to transport your captive critter as soon as possible so he doesn’t injure himself. Wear the heavy gloves and make sure you keep the trap away from your body to avoid being bitten or clawed. The relocation point should be a good five miles away, and you will want to stay clear of the trap door when you open it, in case the critter decides to share its opinion of you. While there are ways to kill a groundhog, we strongly urge against it – and not just because of the slow, horrific suffering these methods cause. Using poisons or shooting a groundhog might seem a viable option, but an injured groundhog is a dangerous one. Instead of being shy, they will become highly aggressive. Another reason to avoid poison and kill traps is the fact that either can prove fatal to other critters, including children and pets. Any poison that works on a groundhog will be equally effective against your family. A roaming cat or dog can easily get caught by snare traps and other lethal types of trap. Why put your loved ones at risk when you can get rid of groundhogs safely? Sometimes the best offense is a good defense, and this is especially true when dealing with critters. A good deterrent will not only keep groundhogs from setting up camp in your backyard, they can also help evict a resident critter. Groundhogs won’t stay where they sense a lot of predators. Sprinkling used cat litter or rags soaked in ammonia will help trick the critter into thinking it’s a dangerous spot. As ammonia can harm your lawn, you will want to place the rags on something to keep it separated from the grass. 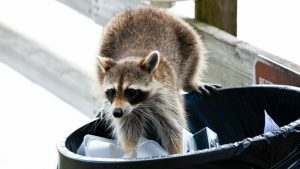 As this method is essentially free for cat owners, it is litter-ally one of the best tricks to for getting rid of groundhogs and other big critters. One of the most useful bathroom supplies can also help fend off hungry critters. Epsom salts are safe to ingest (they have been a popular diuretic for centuries), and groundhogs hate the taste. Simply sprinkle some on your plants and the groundhog will take his business to a different restaurant. Keep in mind, the salts will wash off when it rains, so you will need to reapply them occasionally. The answer to this one is a little complicated. Mothballs can indeed help to get groundhogs out of your yard, but it won’t stop them from returning. When you find a burrow entrance on your property, you can pour some mothballs into the entrance. This will prevent the groundhog from using that entrance for several weeks while the smell dissipates. Unfortunately, simply filling in the hole or throwing more mothballs in occasionally doesn’t keep a groundhog from slipping back into your yard through the fence or from another burrow opening. Getting rid of groundhogs with mothballs can be a useful stopgap method if you’re in the process of installing a more groundhog-proof fence in the garden, but should never be considered a full solution. There are electronic sprinklers on the market which are motion activated. Stick these in your garden and other key spots. When the groundhog gets too close, the sprinkler activates and scares them off. As an added bonus, it waters your plants for you. In your duel against groundhogs, a good weapon is chicken wire. Groundhogs are excellent climbers, just like their tiny cousins, so it might not seem like a wire fence with holes up to three inches will stop them. However, the trick is to bend the fencing into a six foot tall “C” shape. 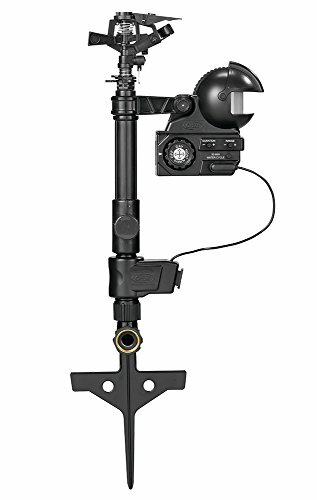 Place two feet of it underground, with the horizontal part facing out. This keeps the woodchuck from getting under the fence. Meanwhile, the outward-facing top part of the C will stop him from climbing over. You might have seen advertisements for groundhog repellents. These are ammonia-based repellents are designed to mimic the scent of predator urine. Unfortunately, their effectiveness is sometimes less than perfect, and it’s usually best to stick to used litter, if the option is available. While groundhogs are generally shy and peaceful, they can attack if cornered or wounded. Groundhog bites can be very painful and should be cleaned and bandaged immediately. You should always seek medical attention as a follow-up to groundhog bites to avoid disease. While gophers themselves don’t transmit this disease, they can carry ticks. Lyme disease has mild symptoms early on, but can develop into temporary paralysis and other neurological problems. Left untreated, it can cause arthritis, impaired memory, neuropathy, and even heart problems. These critters are known to be carriers of rabies and are more susceptible than other rodents. Obvious signs of rabies include foaming at the mouth, erratic behavior, and not being afraid to approach humans. However, a carrier may exhibit no symptoms at all, so be sure to get tested after any encounter. This particularly nasty disease isn’t common, but groundhogs are known carriers. Depending upon how the disease comes into contact with your body, it can have different symptoms ranging from mild to life-threatening. The Mayo Clinic offers a detailed breakdown of this threat. In addition to personal health, their burrows can destabilize buildings and cause property damage. 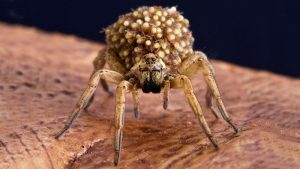 They can also devour food crops and tear up gardens. As with most critters, groundhogs actually have some benefit, if you can learn to live with them in peace. They are known to eat insects, including grubs and caterpillars, which are harmful to your garden. Their burrows can also help aerate the soil. 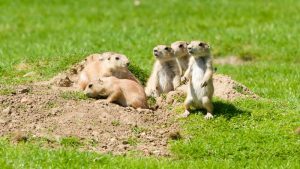 Speaking of burrows, groundhog burrows act like animal hotels, and the groundhog will often allow foxes, skunks, and other critters to share its residence. 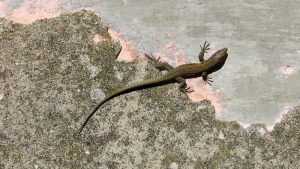 This might sound bad at first, but a critter with a home is far less likely to invade your’s. This sounds a lot like either rats or groundhogs. Both are known to make their home underneath vacant houses. Try setting some traps, and if that doesn’t work, you may need to find out who owns the vacant house and have them bring in an exterminator.